Sounds Like Shellac: THanks for the Support! Wow its been a few weeks since I logged into my Paypal Account and It looks like ive had another Donation, Thanks Its going towards the "rapidshare" Premier Account as mine runs out in a few weeks!! Dont Let Rapidshare "scare" you either, Im doing this on the smell of an oliy rag, Hang on Oils too expensive, The Smell of a Watery Rag, If I had $ I'd have this as a Proper webpage and I'd have some storage space hosted somewhere, Rapidshare is NOT my idea of hosting the files but its the ONLY way I can do it at the time being. So when You click on a song, Have a look for the FREE link. I know its small!! (they like to advertise) And you can only get a few songs a day, But stick with it, It IS free. But If anyone has ANY webspace going to waste Let me know!! 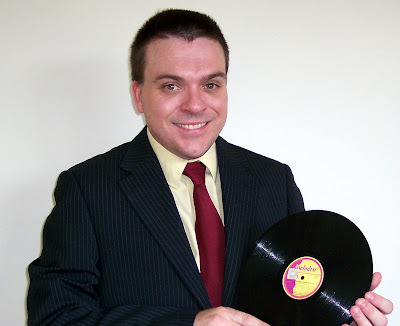 Here's a photo of me made to promote this blog on other blogs/forums. The reason I have a silly grin? It was so hot when i took the pic I had no pants on! Guess the 78 Label Ive got in my hands!! Don't need to guess - I can see quite clearly it's Melodisc. I wish you the best of luck with your pic - your blog deserves to be promoted.